At the annual convention of the NRA, Newt Gingerich gave a rousing speech that was met with much laughter and applause from the members attending. One thing that was most notable in the things he said was that he believes that everyone on earth deserves gun rights and should have their own Second Amendment. Wow, compare that to our current “socialist in chief”. He is currently lobbying members of Congress to adopt the U.N.’s proposed “Small Arms Treaty” that effectively would take away our guns and nullify our own Second Amendment. I briefly digress here but the U.N. Small Arms Treaty that Obama is so enamored with would, “confiscate and destroy all “unauthorized” civilian firearms (exempting those owned by our government of course) and that means yours, ban the trade, sale and private ownership of semi-automatic weapons” (again, that means yours), and other egregious things. I could go on here but I refer you to an article on this in Forbes magazine from June 7, 2011 for more information on this horrific idea Obama wants to foster if he is re-elected to another term. 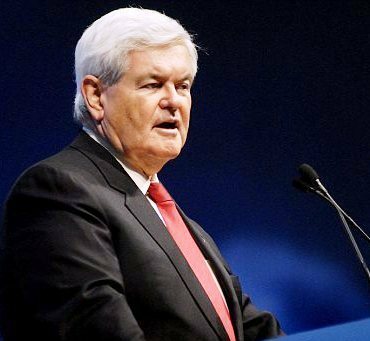 But getting back to Mr. Newt, he has a more logical idea that is 180 degrees the opposite – imagine that. This is the man whom I feel should be at the fore front of our Presidential campaign. I mean if he were to become our candidate for President on the Republican side, he would no doubt mop the floor with Obama. This man speaks from the heart, unlike the Bam Bam who needs a teleprompter to remember his lines. 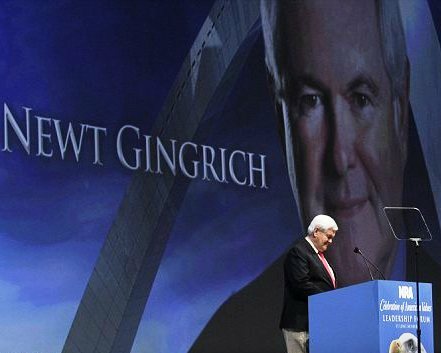 Mr. Newt speaks from the heart because it is part of his core, his personal beliefs, and moral fortitude. He doesn’t need to be reminded what he believes in his sole. He also told the NRA members that “he has been much too timid and moderate in his defense of gun rights.” I think that perhaps he should have been a little more vocal on these issues before now. Maybe he might be a little farther ahead in the race for President. Afterall, this is the man, out of the current stable of contenders that should become our President. I mean, think of it – President Gingerich. Sounds good, doesn’t it? Pass it on. Maybe it will catch on. It’s not too late. Tagged as gun politics, gun rights for all men, Newt Gingerich, NRA annual convention, Obama, Second amendment rights, Small Arms Treaty, U.N.